Do your clothes take more than one cycle to dry? If so then your dryer vent may be clogged! Not only will this make you spend more on energy cleaning your clothes, but it could also spell disaster for your home. 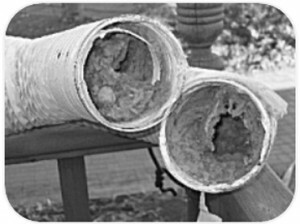 Dryer vent fires occur when lint clogs your vent and overheats to the point of combustion. The National Fire Protection association recommends annual inspections of your dryer vent. Reduced risk of fire: According to the Consumer Product Safety Commission, there are more dryer vent fires each year than chimney fires, and the numbers are on the rise! Reduced drying time: More airflow in the vent means your dryer works more efficiently. Reduced drying time means less running time, lower utility bills, less wear and tear on the dryer and on your clothes. Peace of mind: worrying about lint in a vent behind your dryer can be taxing. Get the job done right by a professional like Black Goose Chimney and you wont have to worry for another year! Why is lint back there? Not all lint is caught in the dryer filter. Lint eventually builds up inside the dryer vent or dryer exhaust duct, as professionals call it. A professional service company can take a reading at the vent termination where it exits the home. By using a vane anemometer, the temperature and airflow speed can be documented. If the duct needs sweeping, the sweeping is completed and another reading is taken to check the numbers. This will give you a “before and after” comparison. The “after” numbers will also serve as a baseline for any future evaluations. The next time you remove your filter to clean off the lint accumulation, try holding it briefly under a running water faucet. You may find the screen will not allow water to pass through. This means air will have a harder time passing through as well, because the filter is coated with residue from dryer sheets. Simply scrub the filter gently with a toothbrush or vegetable brush to remove the residue. One common problem is that birds have taken up residence inside the vent. The most common culprit is the English Starling. The female will fly up to the termination, flip up the cover with her beak, and make a home inside. It is common to remove three to five feet of nesting materials from a vent when removing a bird! Take a look at the termination vent outside the home, if you see bird droppings streaked down the siding, you probably have unwanted guests! Black Goose Chimney is certified by the Chimney Safety Institute of America to clean dryer vents and remove unwanted guests. If your dryer is taking longer than usual to clean clothes, or you smell smoke while doing laundry call Black Goose at (757) 596-2298 to have your dryer vent inspected and cleaned.